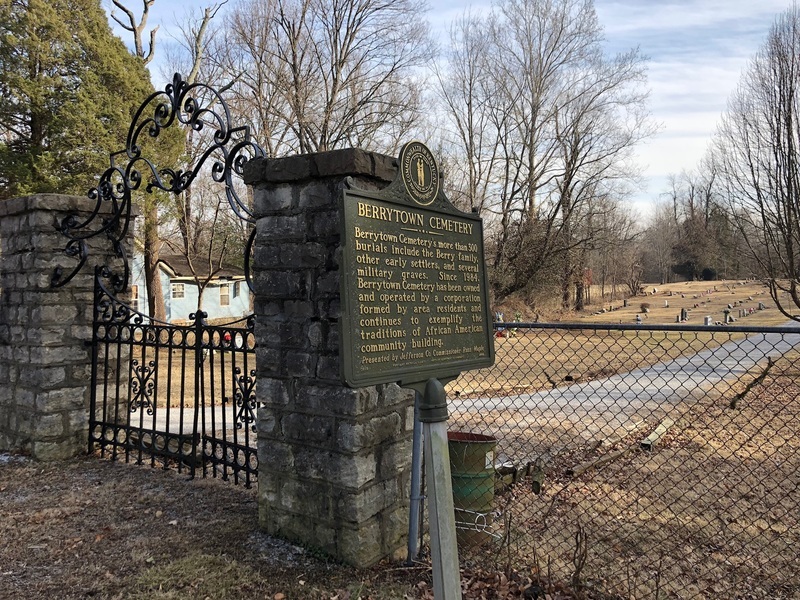 Marker #2032 recounts some of the history of the Berrytown Cemetery in Jefferson County. The cemetery functioned as a central cultural institution for the Berrytown community after it was established in the late nineteenth century. The United Brothers of Friendship Lodge #83 purchased the land for the cemetery in 1890 and it came to hold the remains of members of the community’s founding family, the Berrys, as well as other early settlers in the area and several military burials. The United Brothers of Friendship lodge that founded the cemetery is a strong example of the type of benevolent community organizations that African Americans developed during the nineteenth century. This group was founded in 1861 in Louisville and originally included both free and enslaved members dedicated to community support. Eventually, the organization grew into a secret society with over 60,000 members across the United States and international lodges in Liberia, Canada, and the West Indies. The women’s branch of the group was known as the Sisters of the Mysterious Ten. This organization, and others like it, sought to provide material and spiritual support for its members amid an American society that afforded African Americans little of either. Berrytown Cemetery - Berrytown Cemetery's more than 300 burials include the Berry family, other early settlers, and several military graves. 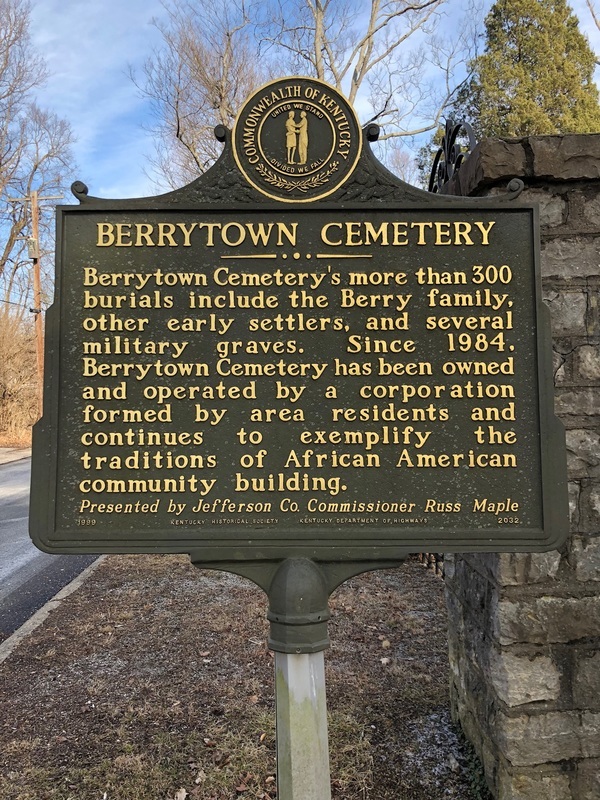 Since 1984, Berrytown Cemetery has been owned and operated by a corporation formed by area residents and continues to exemplify the traditions of African American community building. Presented by Jefferson Co. Commissioner Russ Maple. The marker was dedicated in 1999. 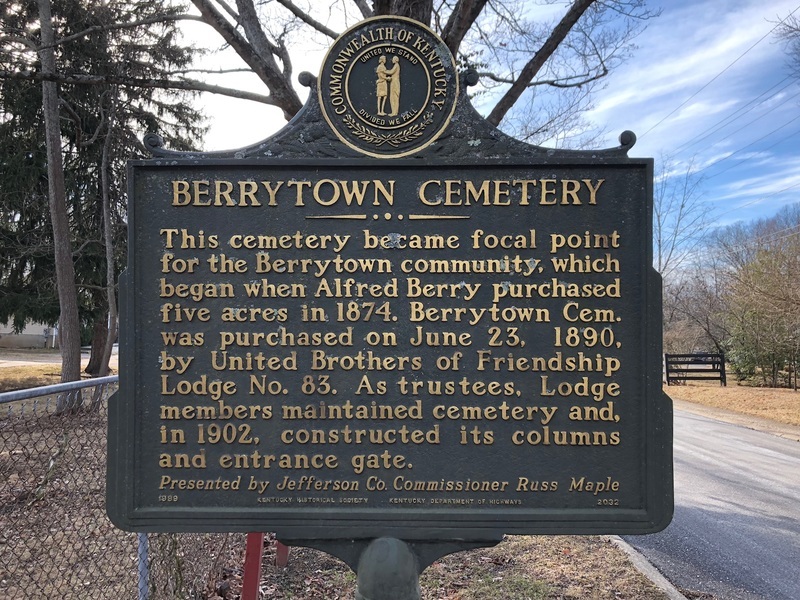 Andrew Patrick, “Berrytown Cemetery,” ExploreKYHistory, accessed April 22, 2019, https://explorekyhistory.ky.gov/items/show/823.